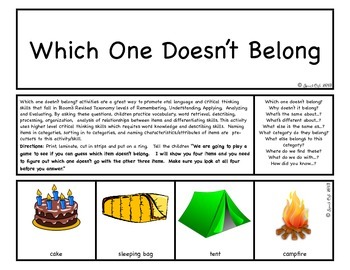 Which one doesn’t belong activities are a great way to promote oral language and critical thinking skills that fall in Bloom’s Revised Taxonomy levels of Remembering, Understanding, Applying, Analyzing and Evaluating. By asking these questions, children practice vocabulary, word retrieval, describing, processing, organization, analysis of relationships between items and differentiating skills. This activity uses higher level critical thinking skills which requires word knowledge and describing skills. Naming items in categories, sorting in to categories, and naming characteristics/attributes of items are pre-cursors to this activity/skill. This file contains 12 color pages which includes 34 items, each with 4 pictures in a strip. These pages are intended to be printed on card stock, laminated and put on a ring. 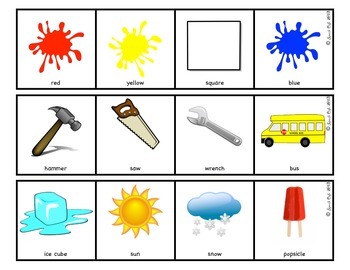 These have colorful pictures that make the activity great for younger (PK-K) students or those that are not quite ready for the activity without pictures (Transition Talk Volume 5, also available in my TPT store). This activity works well for individual or small group activities as well as a transition activity.